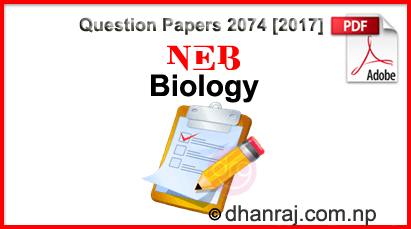 Note:This question paper contains Botany portion in Group 'A' and Zoology portion in Group 'B'. So use separate answer sheets for Group 'A' and Group 'B'. First use answer sheet for Group 'A'. a) What is nuclear membrane? d) What does it mean by species? e) Write positive effects of bacteria. f) What do you mean by roots? b) Structure and function of chloroplast. e) Lateral conjugation of spirogyra. f) Male cone of Pinus. g) Importance of land management. Describe the family Leguminosae in semitechnical terms with identifying characters, floral diagram and floral formula with examples of economic value. a) Define the term Omithology. b) Write the full form of IUCN. c) How is Zoology related with Chemistry? d) Differentiate between primary and secondary pollutants. e) Give the reasons of fish migration. f) Write two volant features of bat. g) What do you understand by leadership? h) What are analogous organ? Give example. i) Why do frog go under hybernation? j) Give the scientific name of Grarden snail and tapeworm. a) Describe the sporogony phase of life cycle of Plasmodium. c) Describe the causes of wildlife extinction. d) Enlist the functions of liver of Frog. e) Describe Miller & Urey's experiment. f) Explain draw-backs of theory of Natural Selection. g) Mention the characteristic features of Class-Mammalia. What is digestion? Give an account on the digestive tract of Pheretima with suitable diagram. 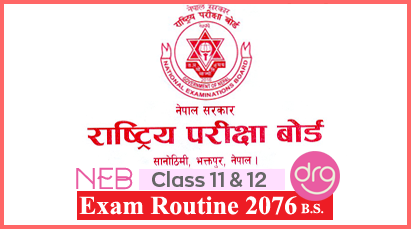 1 Response to "Biology | Botany/Zoology | Grade XI | Exam Paper 2074  | National Examinations Board"